Whether you are an experienced freelance travel writer with hundreds of published pieces or new to writing but have a passion for travel and exploring cultures, here are five companies that pay freelance writers to write, research and love traveling. Matador Network hires contributors to write content that “speaks to the adventures, cultures, and identities of people around the world”. Matador pays per piece with an average of $20-25 and sometimes as much as $60 in special circumstances. Payout is once a month. You can browse Matador Network to learn more about the style of writing and the type of articles they are interested in. If you feel you would be able to contribute to Matador then you will be asked to send in a draft following the author guidelines. Plum Deluxe is regularly looking for travel writer contributors as well as other life and style based articles. Although Plum Deluxe may not offer regular freelance income, it may be a good fit for your travel article ideas from time to time. Articles earn writers $30 each at Plum Deluxe. Specifically, they are looking for Weekend Getaway type of content. Plum Deluxe accepts work from both new and experienced writers. However, you will need a sample article or profile. The Expeditioner appeals to freelance writers who enjoy covering “top 10? pieces, location overviews, and long-form pieces”. Expeditioner simply wants the content to be interesting, informative and inspiring to future travelers. The Expeditioner pays $30 per article after it is published and best of all, authors are able to include a personal bio piece below each article. 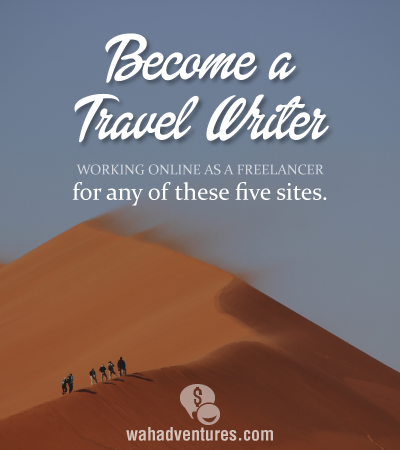 This offers a great way to build your profile as a Freelance Travel Writer. Travel Writers are often needed to join Tripbase. In addition to having a love of travel and the ability to write engaging content, Tripbase looks for freelance travel writers who also have an eye for quality images. Tripbase offers work on a regular basis to their team of writers and pays $30 per article. This company offers a highly informative post titled “Breaking into Travel Writing” that gives advice and educates how to come out ahead in the competitive field of Travel Writing. Unanchor offers a freelance job in travel writing that is not typical. Travel writers for Unanchor write travel itineraries that are sold on the site. The writer earns 75% of the revenue from sales. Becoming an Itinerary Writer for Unanchor seems pretty straight forward. The application process is short and simple. Browse Unanchor and request a sample itinerary to know what will be expected from travel writers. Payments are made to writers once a month via your choice of either PayPal or Check. As a freelance writer, it will be of your best interest to work with several companies at a time to ensure a workflow. Best wishes to everyone who decides to submit applications and sample writing to any of the above 5 travel writing sites.